This month I have to admit to being a bit short on ideas when it came to picking a catfish to feature. After some on and off thought about it, I decided to take the scientific approach and wrote a bit of software to find out from the PlanetCatfish database which species was most accessed that had not featured in its own article as yet. Perhaps unsuprisingly the top hits came back as all plecos. I had to go past 34 suckermouths to find something else. And so, with my apolgies for a rather dull selection method, here's a more commonly found catfish than viewing statistics might make you think. Upside down catfish, or to give them a name which is perhaps a bit more accurate, Squeaker cats are from Africa. Upside down catfish isn't the best name for them as only a few species spend nearly all of their time upside down and there are actually other catfishes from other families that do the same. The latter is however something of a moot point and squeaker isn't that better either as they don't claim to be the sole type of catfish that makes a jarring, squeaky noise when removed from the water. To my knowledge they are the only group of catfish that do that from Africa, so, for this article today, let's call them squeakers. If you don't like that, you can stick with the families formal name, Mockokidae - no squeaking there and it does sound wonderfully African. This is a large genus of (at the time of writing) 123 species and has had a place in the aquarium hobby since the first frewshwater fish began to arrive from Africa. Although many peoples favourites, these characterful and sometimes very colourful fish have been somewhat out of fashion for a decade or two now. 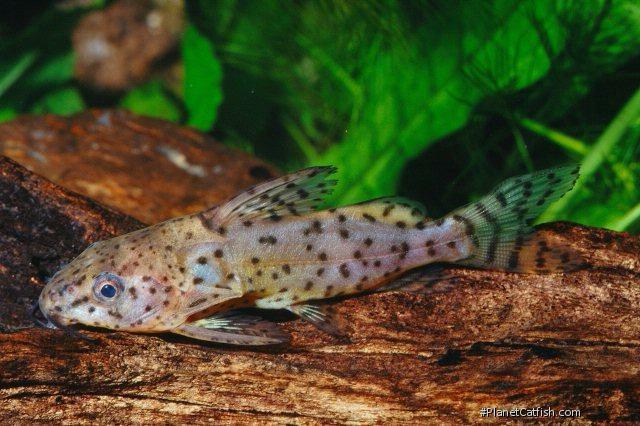 Despite this, you're likely to find this very common member, the spotted catfish, Synodontis nigrita, or as it is sometimes known as the "false upside down catfish" owing to the aforementioned ill placed naming for a fish that doesn't spend all that much time actually upside down. There are many, many spotted catfish in the world. In fact, there are many spotted Synodontis. Their background colour is lighter and the spots are all across the fins and body when youngsters. As they mature they begin to change to take on a dark brown base with fewer spots especially less on the body. There are always spots on the fins and these tend to cluster somewhat on the fleshy adipose fin. In increasing difficulty of telling them apart and in terms of those you will find commonly in fish stores, when young, this species is sometimes confused Synodontis eupterus which can look similar when young but have more of a network pattern and high fins. Another similar species to the adult is the brown spotted Syno, Synodontis robbianus, generally, and rather unrelaibly, this species keeps more spots going into adulthood and but does firmly only reach a smaller size of around 13cm. (5"). The adipose fin is also higher but the two can be tricky to tell apart. This species is exceptionally hardy, inexpensive, will eat almost all aquarium foods and doesn't grow especially big. It's an excellent catfish for the slightly more boisterous aquarium. Type Locality Senegal R., Senegal. Size 275mm or 10.8" SL. Find near, nearer or same sized spp. Commonly misidentified in the trade. Contaminants often include S. nigriventris and small juveniles of many West African Synodontis species. S. nigrita has a dark gray background with black spots on the body and fins, giving it a ''lace-like'' appearance, hence the common name: ''lace catfish''. Humeral process ends in a point, sweeping up in a curve on the bottom edge. Sometimes swims in an inverted position. General Remarks An explanation is in order as to the status of the synonym, Synodontis ornatus. There is a paper by Pappenheim & Boulenger(1914) using Synodontis ornatus which shows a drawing of a fish that very much looks like a Synodontis nigrita, the fish shown in this paper is now considered a synonym of S. nigrita. A second paper by Boulenger (1920) using Synodontis ornatus shows a drawing of a fish that looks like the images that are shown for Synodontis ornatissima which this second ornatus is now a synonym of. Distribution One of the most common of all Synodontis species. Widely distributed across Africa, including the Nile basin, Chad, Niger, Senegal, Gambia, Casamance, Geba, Kolente and Volta basins, and coastal rivers from Ghana to Nigeria. Other Parameters In nature, congregates in pools and ponds by the side of large rivers, but is typically not found in the rivers themselves. Feeding Omnivore. Feed flakes and tablet food, supplemented by frozen and live food. In nature, eats plant detritus and small crustaceans and insects. Be careful not to overfeed. Has gluttonous appetite. Juveniles grow quickly. Compatibility Relatively peaceful, though older specimens can become territorial. Breeding In nature, breeding occurs during flood season. It is uncertain if bred commercially by hormone injection or if it has been bred in the aquarium.